This is an awesome Thanksgiving side that we practiced ahead of time to make sure it was better than that classic casserole made with a soup can. We wanted to switch it up and make it from scratch, while also taking handy short-cuts to make it an easy side to go along with the million other things we make on the big day. I took the components that sounded the best from other recipes I found online and mashed them together to make this. Speaking of which, this was fantastic smushed up against some mashed potatoes. Green beans, of course: You’ll need about two pounds if you are going to buy fresh beans that you’ll clean and snap yourself, but we saved a ton of time by buying two 12 ounce bags of prepared green beans from Target. You can find them near the bags of salad. Baby bella mushrooms: We also took the shortcut of getting already cleaned and sliced mushrooms so all we had to do was cut them in half. Preheat the oven to 375 degrees. Cut one of your onions in half and dice half the onion. Slice the remaining onion and a half as thinly as possible (a mandolin is handy for this if you have one and was another time saver for us). Lightly oil a large baking sheet. In a small bowl, mix the 1 cup of flour, 1 teaspoon of cayenne pepper, and salt and pepper to taste. Dredge the thinly sliced onion through the flour mix and shake off the excess before laying in an even layer in your oiled baking sheet. Pop that in the oven keeping a close eye on the onions for approximately 10 minutes or until golden brown and crispy. Next, melt the butter in a pan (we used cast iron) on the stove and cook the mushrooms in one even layer over medium heat until they begin to release their juices and soften. If they seem dry, feel free to add splashes of olive oil or additional butter as needed. Then, add the onions and garlic and cook until the onions are translucent before adding the green beans. 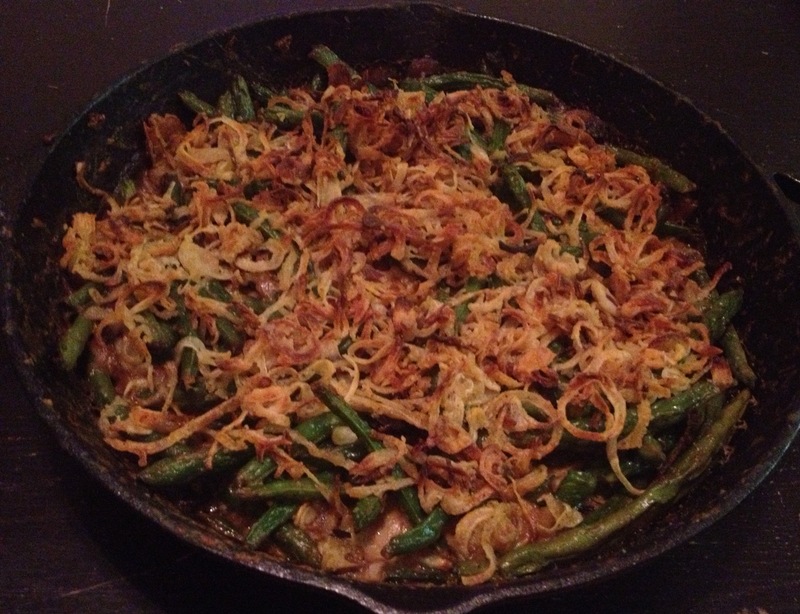 Cook until the green beans turn bright green and shiny. Then, sprinkle the flour over the vegetables and add the cream and chicken stock. Once mixed together, this mixture should thicken and you can add salt and pepper to taste (the amount you need will depend on your brand of chicken stock). If your mixtures seems too runny, add teaspoons of flour until creamy. Finally, top with the crispy onions and bake in the oven for approximately 20-25 or until the whole thing is hot and bubbling. The hardest part of this whole recipe is waiting for it to cool for a few minutes before breaking into it! As with all of our recipes, I encourage you to tweak and experiment. This would be a good one to add a splash of sherry or marsala wine to substitute some of the liquid or to toss some fresh herbs at the end of baking for a hit of freshness. Enjoy!